▪ Malia Obama was captured on video this week kissing a British-born classmate during a tailgate party for the Harvard-Yale football game. 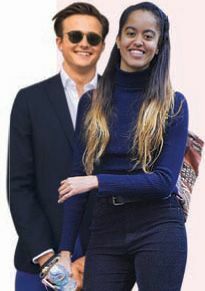 The former first daughter’s new beau is reported to be Harvard sophomore Rory Farquharson, who attended the elite Rugby School in England. His father is the CEO of a London investment company. The viral video shows 19-year-old Obama smoking and smiling, before wrapping her arms around Farquharson. The video’s publication prompted other first daughters to jump to her defense, including Chelsea Clinton and Ivanka Trump. “Malia Obama should be allowed the same privacy as her school aged peers,” Trump tweeted.